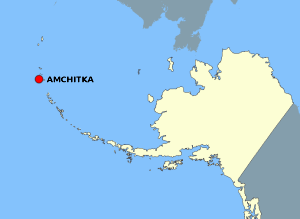 Amchitka is the southernmost of the Rat Islands group in the Aleutian Chain, located between 51°21′N 178°37′E﻿ / ﻿51.350°N 178.617°E and 51°39′N 179°29′E﻿ / ﻿51.650°N 179.483°E. It is bounded by the Bering Sea to the north and east, and the Pacific Ocean to the south and west. To conduct the Vela Uniform test Long Shot,51°25′35.84″N 179°11′14.13″E﻿ / ﻿51.4266222°N 179.1872583°E the Department of Defense occupied Amchitka from 1964 to 1966, with the AEC providing the device, measuring instruments, and scientific support. The goal was "to determine the behavior and characteristics of seismic signals generated by nuclear detonations and to differentiate them from seismic signals generated by naturally occurring earthquakes." Though performed as part of the Nuclear Weapons Testing Program, "[the] purpose of the Milrow test was to test an island, not a weapon." It was a "calibration shot", intended to produce data from which the impact of larger explosions could be predicted, and specifically, to determine whether the planned Cannikin detonation could be performed safely. Milrow was detonated on October 2, 1969 51°24′52.06″N 179°10′44.84″E﻿ / ﻿51.4144611°N 179.1791222°E, with an approximate yield of 1 to 1.2 megatons (4.2–5.0 PJ). Cannikin was detonated on November 6, 1971 51°28′13.20″N 179°6′40.75″E﻿ / ﻿51.4703333°N 179.1113194°E, as the thirteenth test of the Operation Grommet (1971–1972) underground nuclear test series. The announced yield was 5 megatons (21 PJ) – the largest underground nuclear test in US history. (Estimates for the precise yield range from 4.4 to 5.2 megatons or 18 to 22 PJ). The ground lifted 20 feet (6 m), caused by an explosive force almost 400 times the power of the Hiroshima bomb. Subsidence and faulting at the site created a new lake, several hundred meters wide. The explosion caused a seismic shock of 7.0 on the Richter scale, causing rockfalls and turf slides of a total of 35,000 square feet (3,300 m2). Though earthquakes and tsunamis predicted by environmentalists did not occur, a number of small tectonic events did occur in the following weeks, (some registering as high as 4.0 on the richter scale) thought to be due to the interaction of the explosion with local tectonic stresses. The 407th Air Expeditionary Group (407 AEG) is a provisional United States Air Force unit assigned to the United States Air Forces Central Command 332d Air Expeditionary Wing. It was stationed at Ali Air Base, Iraq until the closure of the base on 16 December 2011. It was activated as part of the 332d Air Expeditionary Wing due to Military intervention against ISIL at Ahmad al-Jaber Air Base. The 407 AEG provided air operations support for coalition air dominance, battlespace control, and security to advance the stabilization of southern Iraq. It provides coalition tactical airlift support with aerial port operations. The 407 AEG was the first Air Force unit to stand up combat operations within Iraq during Operation Iraqi Freedom. The group traces its history back to the World War II 407th Bombardment Group (Dive) which was established 23 March 1943, at Drew Field, Florida. The air echelon was attached to Eleventh Air Force in Amchitka, Alaska, from 19 July to 15 August 1943, where it performed combat operations against the Japanese in the Aleutian Islands. Amchitka is a 2009 two-CD release of a recording of Joni Mitchell, James Taylor and Phil Ochs performing an October 16, 1970, benefit concert at the Pacific Coliseum in Vancouver. The event funded Greenpeace's protests of 1971 nuclear weapons tests by the U.S. Atomic Energy Commission at Amchitka, Alaska.Irving Stowe, one of Greenpeace's founding members, organized the benefit concert, with the assistance of Joan Baez. She could not appear, but she connected Stowe with Mitchell and Mitchell requested her boyfriend of the time, Taylor, join the concert. The Stowe family held onto tapes of the concert, but were not able to obtain the necessary clearances until John Timmins, brother of Cowboy Junkies members, became involved with Greenpeace. Timmins was instrumental in contacting Mitchell and Taylor's representatives and working out the necessary permissions. The tapes had to be restored by Peter J. Moore, the producer of several Cowboy Junkies albums. Bennett Metcalfe (October 31, 1919 – October 14, 2003) was a Canadian journalist and first chairman of Greenpeace, founded 1971. Ben Metcalfe was born in Winnipeg. Later he moved to the United Kingdom and at the age of 16 joined the Royal Air Force. He was posted in India and North Africa. After World War II he worked as journalist in France. He moved back to Canada in 1951, living in Winnipeg, West Vancouver, and Shawnigan Lake. He worked as a journalist, editor, and freelance correspondent for Winnipeg Free Press, the Province in Vancouver and other publications. He also started a public relations company with his second wife Dorothy. In 1971 he joined the crew member of the Greenpeace boat sailing to protest against U.S. army nuclear bomb test near Amchitka island. When the Greenpeace Foundation was established, Metcalfe became its first chairman. He recognized the importance of a media campaign as a tool to gain support for environmental issues. He left his post when Greenpeace changed focus from nuclear weapons to fighting against whaling and seal hunting. Metcalfe, E. Bennett (1985). A man of some importance : the life of Roderick Langmere Haig-Brown Published by James W. Wood, Vancouver. ISBN 0-921063-01-6, ISBN 0-921063-00-8. Cannikin was an underground nuclear weapons test performed on November 6, 1971, on Amchitka island, Alaska, by the United States Atomic Energy Commission. The experiment, part of the Operation Grommet nuclear test series, tested the unique W71 warhead design for the LIM-49 Spartan anti-ballistic missile. With an explosive yield of almost 5 megatons of TNT (21 PJ), the test was the largest underground explosion ever detonated by the United States.Prior to the main five megaton test in 1971, a 1 Mt (4.2 PJ) test took place on the island on October 2, 1969, for calibration purposes, and to ensure the subsequent Cannikin test could be contained. This test, Milrow, was included in the Operation Mandrel nuclear test series. Daikokuya Kōdayū (大黒屋 光太夫) (1751 – May 28, 1828) was a Japanese castaway who spent eleven years in Russia. His ship landed at Amchitka, in the Aleutian Islands. The crew managed to travel to the Russian mainland and Catherine the Great allowed them to go back to Japan. This was made possible through the efforts of Kirill Laxman, Alexander Bezborodko, and Alexander Vorontsov. Two of the crew made it back to Japan alive, though one died while they were detained in Yezo (Hokkaidō). Of the original crew, two converted to Christianity and stayed in Irkutsk, and 11 others died. The Delarof Islands (Aleut: Naahmiĝun tanangis) (ca. 51°23′13″N 178°57′47″W) are a group of small islands at the extreme western end of the Andreanof Islands group in the central Aleutian Islands, Alaska. The Delarofs consist of 11 named islands: Amatignak, Gareloi, Ilak, Kavalga (Qavalĝa), Ogliuga (Aglaga), Skagul (Sxaĝulax̂), the Tags (Tagachaluĝis), Tanadak (Tanaadax̂), Ugidak (Qagan-tanax̂), Ulak, and Unalga (Unalĝa). These islands are separated from the remainder of the Andreanofs by Tanaga Pass to the east and from Amchitka and Semisopochnoi (the easternmost of the Rat Islands) by Amchitka Pass to the west. All of these islands are managed as part of the Aleutian Islands Unit of the Alaska Maritime National Wildlife Refuge. The Delarof Islands together have a land area of 63.842 sq mi (165.349 km²). None of the islands are populated. The Delarof Islands were named in 1836 by Captain Fyodor Petrovich Litke of the Imperial Russian Navy. He named them after Greek-born administrator Eustrate Ivanovich Delarof (also spelled Evstratii Ivanovich Delarov), who was the chief manager of the Shelikhov-Golikov Company (precursor of the Russian-American Company) from 1787 to 1791. The Eleventh Air Force (11 AF) is a Numbered Air Force of the United States Air Force Pacific Air Forces (PACAF). It is headquartered at Joint Base Elmendorf–Richardson, Alaska.11 AF plans, conducts, controls and coordinates air operations in accordance with the tasks assigned by the commander, Pacific Air Forces, and is the force provider for Alaskan Command, the Alaska North American Aerospace Defense Command Region and other unified commanders. Gareloi or Anangusook (Aleut: Anangusix̂) is a volcanic island in the Delarof Islands of the Aleutian Islands of Alaska. It is located between the Tanaga Pass and the Amchitka Pass. The island is 6 miles (9.7 km) in length and 5 miles (8.0 km) wide. Its land area is 25.95 square miles (67.2 km2), making Gareloi the largest island in the Delarof group. Gareloi Volcano, a stratovolcano, is situated in the center of the island which reaches a height of 5,161 feet (1,573 m). On the other side of a small saddle lies another peak of the island however it does not equal the height of Mount Gareloi. The island is uninhabited. Coastal cliffs provide nesting habitat for more than 600,000 seabirds, mostly for crevice nesting auklets. Least Auklets account for 62% of the colony, Crested Auklets for 30%, and Parakeet Auklets for 6%. Each of these species is present on the island in numbers exceeding 1% of their global populations.The island consists of lava rock, black lava, eroded lava, and ashes; the lower slopes and valleys are covered with grass and tundra in many places. The shores have steep cliffs with rocks and boulders at the base; boulders, pinnacles, and rocks awash extend around the shoreline. Heavy kelp surrounds most of the island, and extends offshore to 10 fathoms (18 m). Depths of 10 fathoms or more are within 0.5 miles (800 m) of the island. A trapper’s hut is on the beach above the N shore of Gareloi Island.Gareloi's northern, slightly higher peak is on the southern rim of a crater about 330 yards (300 m) across, which contains several active fumaroles. Thirteen younger craters, from 87 yards (80 m) to 1 mile (1,600 m) in diameter, are aligned along a south-southeast trending fissure that extends from strandline to the southern summit. These craters formed during a major explosive eruption in 1929 that also produced four blocky lava flows, and a blanket of grassy andesitic tuff that covers an area roughly 1.5 by 3 miles (2.4 by 4.8 km) on the volcano's southeast flank. Gareloi Volcano had four confirmed eruptions in the 1980s and one unconfirmed eruption in 1996. All but one of them were considered explosive eruptions. In Spring and Summer 2007 there was a period of increased seismic activity on Gareloi Island, sometimes reaching 40 earthquakes per day. Irving Harold Stowe (July 25, 1915 – October 28, 1974) was a Yale lawyer, activist, and a founder of Greenpeace. He was named one of the "BAM 100" (Brown University's 100 most influential graduates of the 20th century). In June 1942, the Imperial Japanese Navy invaded and captured Attu Island and Kiska. This marked the first time in 130 years that United States soil was under occupation by a hostile country. The Americans wanted to recapture the two islands, and in January the following year began their advance by capturing Amchitka without opposition. On March 26, the Battle of the Komandorski Islands ensued after the United States Navy imposed a naval blockade on the two islands to reduce the opportunities for the Japanese to keep their Attu and Kiska bases supplied. In May, Attu Island was recaptured, with a total of almost 3,000 deaths from both sides combined. The Americans then prepared to attack Kiska in August, only to find that the entire island had been evacuated by the Japanese in late July. During the recapture of Kiska by the United States, 92 men died as a result of friendly fire and a mine, despite no Japanese soldiers being present on the island. During the 1960s and early 1970s, the United States Atomic Energy Commission (AEC) executed a number of nuclear tests on the island of Amchitka in the face of vehement opposition from environmental and local indigenous groups. The first test, conducted in 1965, caused significant damage to the surrounding area, although the details of this damage were not released to the public until 1969. In 1969, the AEC executed a 'calibration shot' to determine whether Amchitka would be suitable for future tests. In 1970, the AEC announced plans to detonate a bomb named 'Cannikin', set to release a blast 385 times that released by the dropping of an atomic bomb on Hiroshima in 1945. After a United States Supreme Court challenge to the testing failed by one vote, the testing proceeded as scheduled in November 1971. The pelagic cormorant (Phalacrocorax pelagicus), also known as Baird's cormorant, is a small member of the cormorant family Phalacrocoracidae. Analogous to other smallish cormorants, it is also called the pelagic shag occasionally. This seabird lives along the coasts of the northern Pacific; during winter it can also be found in the open ocean. Pelagic cormorants have relatively short wings due to their need for economical movement underwater, and consequently have the highest flight costs of any bird.Many authors favor splitting up the "wastebin genus" Phalacrocorax. In this case, the pelagic cormorant would probably be placed in Compsohalieus. The Rat Islands (Aleut: Qax̂um tanangis) are a volcanic group of islands in the Aleutian Islands in southwest Alaska, between Buldir Island and the Near Islands group to its west, and Amchitka Pass and the Andreanof Islands group to its east, at about 51°47′17″N 178°18′10″E. The name Rat Islands is the English translation of the name given to the islands by Captain Fyodor Petrovich Litke in 1827 when he visited the Aleutian Islands on a voyage around the world. The islands are named so because rats were accidentally introduced to Rat Island in about 1780. As of 2009, after a government-funded eradication program, Rat Island is believed to be rat-free; it was renamed Hawadax Island in 2012. However, a post-operation assessment found that many of the local bird populations that the operation was designed to aid were negatively impacted—there was a far higher-than-expected nontarget mortality. An internal U.S. Fish and Wildlife Service Office of Law Enforcement investigation revealed that several laws may have been violated.The Rat Islands are very earthquake-prone as they are located on the boundary of the Pacific and North American tectonic plates. In 1965, there was a major earthquake with a magnitude of 8.7 in the Rat Islands.